Little Owls aren’t rare in our parishes, but they do go quietly unnoticed much of the time. For one, they aren’t called Little for nothing. They are pipsqueaks. But they are, if you know where to find them, the easiest of our owls to get a good look at. And there’s a particularly good spot along Firle Bostal, where on a sunny day you’ll be unlucky to miss one. Follow the road up from Firle School as if you’re going to the Beacon car park, until you get to the intersection with Chalky Road – just after the strip of trees on the left-hand side, before you start ascending the hill. On the right-hand side, set back from the road, is a barn (‘New Elms’) and a cattle shed. If you scan the buildings with a pair of binoculars, you’ll often find a solitary owl perched on one of the roofs, on a nearby fencepost or on a ledge along the outer flint wall of the barn. Occasionally there are two. This side of the barn faces east, and Little Owls love to sit in the sun, so mornings are best. If one isn’t immediately obvious, try checking the scrub just to the south, the nearby telegraph wires, or (for real glamour) the manure heap on the other side of the hedge, just north of the barn. [The Little Owl] has a pair of white ‘eyebrows’ that meet in a knot on the forehead and impart an expression either of total surprise or intense irritation. The bird will often bob its head vigorously but without losing eye contact, an action that rather suggests a person adjusting the angle of their vision over a pair of bifocals. More on Little Owls over at the RSPB website. Went there today, 5 September 2012, but no luck. I will try again at regular intervals. Thanks Charlie – I will try again this week. 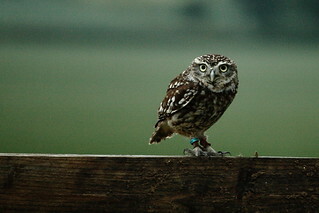 Saw the Little Owl this morning about 07.40. It was on the wall on the south side of the barn just in front of the black sileage bags. Magnificent views – it was a pity we had to leave but we were on our way to an SOS outing at Seaford. That great Bob, glad to hear it! Any sign of the Little Owl in 2013? I have tried twice, without success. Hi Bob. Have only seen an owl there once so far this year – it was in the scrub beside the pond, and I only noticed it because the thrushes were giving it stick. The lack of sun may be a factor in how easy it (they?) are to see. It was back in the spot by the barn entrance again yesterday, soaking up a rare bit of early sun. I will get down a few times in the next week and with luck could see it. Can’t wait.